Whenever an American Idol contestant decides to audition by singing one of the judges' hit singles, it's always a risky move. But sometimes, it pays off big. When Caitlin Lucia stood before Katy Perry, Luke Bryan and Lionel Richie on Sunday's American Idol, the 22-year-old aspiring singer told the Perry that she was one of her biggest musical influences, and that she had even been playing gigs at Hotel Café for three years, the same place the "Swish Swish" singer got her start. To show just how much she had been inspired by Perry, Lucia decided to perform her 2008 track "I Kissed A Girl." Strumming away at her guitar, the young Idol hopeful delivered a beautiful, bluesy rendition of the famous single that really blew the judges away. 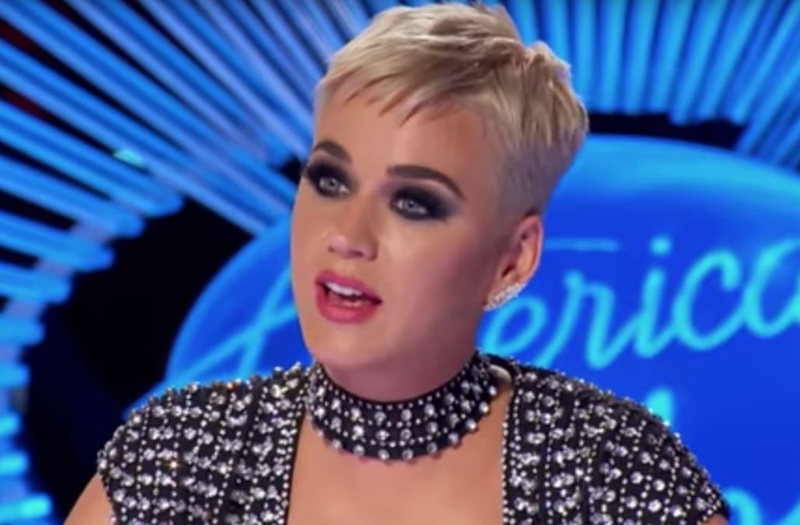 "Usually, I say to a contestant singing my song, 'Sing it as good as or better [than me],' and I think she might have sung it better," Perry said, jokingly feigning frustration. "You gave it a really incredible original spin." However, Perry and her fellow judges said they wanted to see the singer deliver something even bigger. "I think you've got a bigger motor than you're showing us, though," Perry said. "We can hear it," Richie added. "I mean, you're just cruising along, touching the top, and there's more after that top. I know there is." Lucia will get a chance to show just how much more she can give, since all three judges voted her through to Hollywood. Another Idol hopeful who impressed the judges with her performance was Gabby Barrett. The singer was accompanied to the auditions by her father, who she said has been supporting her dream of being a musician since she was a little girl. "My dad has sacrificed so much for me, and I'm gonna go in there with my head high and they gotta pick me," an emotional Barrett said in a pre-taped solo interview. The 'American Idol' cast gets wild at the Season 4 Top 12 Finalists Party. Nearly 15 years after taking the 'Idol' crown, she's the bonafide queen of country music. Pretty crazy transformation! The rocker continues to make music and recently had a string of shows in Hawaii. After long-fought battles with drug and alcohol abuse, Jessica was eventually sentenced to a year in rehab. She now has a child of her own and speaks to kids about the dangers of substance abuse. She has a standing gig every night singing at Las Vegas' Cosmopolitan Hotel. She also created a web series based on her life, which premiered in 2017. The dreads are gone! He's a music educator and creative arts advocate. He's snagged a number of leading Broadway roles, including the title role in "Jekyll and Hyde." She still makes and performs new music. How's that for a makeover? He still makes music and is a proud father. So gorgeous! She continues to pursue her career in music. The singer-songwriter was at this year's Oscars, proving that you don't need to win "American Idol" to end up on the red carpet. He's mostly kept a low profile since the show. The 17-year-old singer had a rough start, singing a cover of Carrie Underwood's "Good Girl" that the judges stopped soon after she began. Bryan and Richie explained that they wanted to hear Barrett's voice, not just her impression of Carrie Underwood. All the while, her excited dad stood outside the room, listening through the door to hear how the audition was going. The young songstress then showed her true personality with a beautiful rendition of a church song that blew the judges away and earned her a golden ticket to Hollywood. However, before the audition was over, Perry thought it would be hilarious if they pranked Barrett's dad by telling him that his little girl "didn't make it through." Perry went out to grab the dad to break the fake bad news, while Barrett waited in the room, hiding the golden ticket, and pretended to be sad. As Perry pretended that his little girl was heartbroken, his daughter turned around beaming with the ticket and the dad burst into tears of joy. Back in November, ET caught up with the judges before auditions kicked off, and all three agreed that one of their biggest tips to hopefuls is to not try and sing the judges' famous songs. "Never," the judges resoundingly concurred. "Because here is the thing -- we have heard those songs so many times, day in and day out," Perry admitted. "And God bless ... I love my songs, I am so grateful for them ... but I don't need to hear them again." "Unless you interpret them extremely differently," Perry added, explaining that she wouldn't mind hearing her own tunes "if you sing them better than us."